Synergized Ingredients is founded on the premise that good faith, integrity and environmental responsibility are eminently compatible with good business. From our founding, the commitment to search for and implement sustainable ways of doing business has been an integral way of thinking here at Synergized Ingredients. Looking out our windows at the dramatic redrock mesas and snow-capped mountains that make Moab such a special place to live and work is a constant reminder that we need to continually find new ways to preserve and protect our vital ecosystems. As a recognized leader with many years of experience in developing environmentally responsible business practices, we’ve also learned that eco-oriented sustainability is not enough. We believe that to become a sustainable business in the fullest sense of the word requires the development of a particular business culture—one that values and fosters long-term relationships. We’ve learned that what makes a business truly sustainable are the many ties that bind. The loyalty and good faith that we extend to our partners and farmers, and the loyalty and trust our customers extend to us, work in concert to create a business that’s sustainable. And that’s a really key point, because the healthier and more sustainable our business is, the more capable we are of supporting, and creating an innovative array of eco-friendly business practices. For this reason, we view sustainability as a twofold discipline that combines a relationship-oriented business culture with a commitment to finding the most eco-friendly way of conducting our business. This complementary pairing creates a particular synergy that we call the synergy of sustainability. Here in Moab, Synergized Ingredients helped to organize a citywide initiative to promote participation in the “Blue Sky Wind Power” program. Not only was Synergized Ingredients the first company in Utah to convert 100% of our electricity usage to this renewable, nonpolluting source, but we actively encouraged other businesses and individuals (beginning with our own employees!) to make a similar choice. The effort was truly worth it, as we succeeded beyond everyone’s expectation in helping to convert 13% of Moab’s energy users to renewable sources. 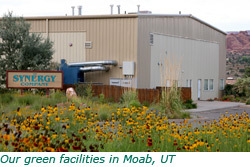 This accomplishment was considered so inspirational and significant that Moab was formally designated by the EPA as the first Green Power Community in America (2004). This decision to use wind power did mean that we would pay a premium for our electricity, but we feel this relatively modest differential is well worth the added expense. Over the years, our usage of wind power alone has led to the reduction of thousands of tons of carbon dioxide emissions. 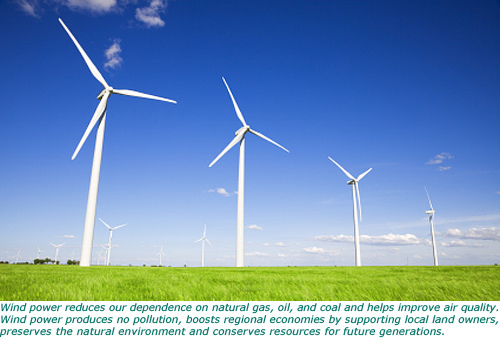 And just as importantly, it has helped to inspire others in our community to opt for wind power as well. Opting to use wind power for our Moab facilities has brought lots of direct benefits, but it only addresses a portion of the overall carbon footprint associated with our full scope of business activities. Like every other business, we have many other activities that can add to global warming and resource depletion. To 100% offset the impact of all these activities, Synergized Ingredients, in cooperation with Plant-It 2020 (started by the late folk singer John Denver), created SynerTrees™ many years ago—a reforestation program to annually plant indigenous trees in the United States at a rate that exceeds our own consumption. Going one step further, we support a special jobs program where our seedlings are planted by inner-city youths to give them the opportunity to connect more directly with their natural environment and engage them at an early age in sustainability-related activities. Perhaps one of our most significant contributions to improving the environment (and your health!) 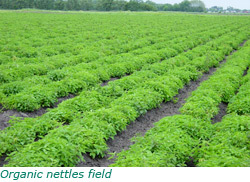 has been our decision to grow, source and promote the development of organic ingredients for our products. Our decision to “go organic” has served as the cornerstone of our commitment to sustainable business practices since our very first days as a company. By supporting organic farming practices, we not only reduce the depletion of resources, but we revive and restore the nutrient-rich soils upon which our country is singularly dependent. And while Synergized Ingredients' commitment to organics may have started out small, engaging a handful of farmers with a few acres of organic farmland, today we have over 3,000 acres of organic cropland dedicated to the cultivation of our ingredients. Your choice to “go organic” for your foods and dietary supplements may very well be the single most influential thing that you can do to help restore environmental health, renew communities and protect your own and your family’s health. Another significant initiative we took in becoming a more sustainable company was our decision to build our own customized “green” facilities here in Moab. This decision allowed us to incorporate low-impact and sustainable technologies into all aspects of our operations. From the selection of xeriscape (water conserving) landscaping, to low-flow toilets, to energy efficient equipment, to automatic light sensors, we’ve taken every measure to make our operations more eco-friendly. Our newest administrative and customer service building is constructed from Rastra—a composite of recycled polystyrene, cement and concrete—and was designed with passive solar orientation, radiant in-floor heating, low-energy cooling and, equally important for our employees, awesome views from their offices! Every day, for every task we perform, we ask ourselves if a more eco-friendly way to perform that task exists. Not surprisingly, the answer is very often "Yes!"